While we're sitting in the Budapest airport, en route to Amsterdam via Frankfurt, we thought Matt should wrap up his Goulash Chronicles before we leave the goulash part of the world and before he leaves to go home on Thursday, and now that he's finished reading Julie/Julia. 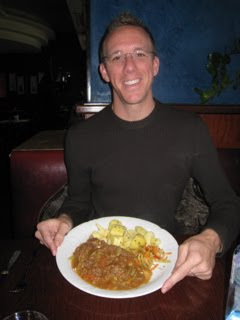 This is Slovakian goulash, in Bratislava, which he has pronounced the best! It is spicy with vegetables, and is more stew like than others.